The HPE and Veeam partnership brings comprehensive data protection for Hybrid IT. Veeam software integration with HPE storage solutions lets you create application-consistent backups from HPE storage snapshots for fast and efficient data protection. For long-term external storage, HPE StoreOnce provides deduplication for efficient storage utilization and fault isolation for data. 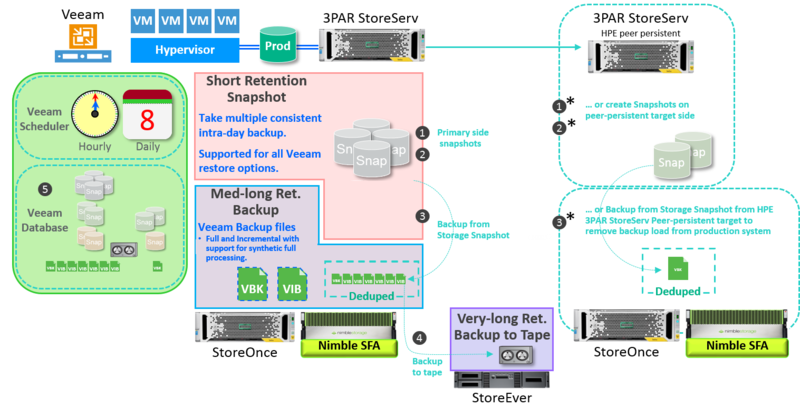 In addition, Veeam can send backups to HPE StoreEver tape storage or to the cloud for long-term off-site data archival. 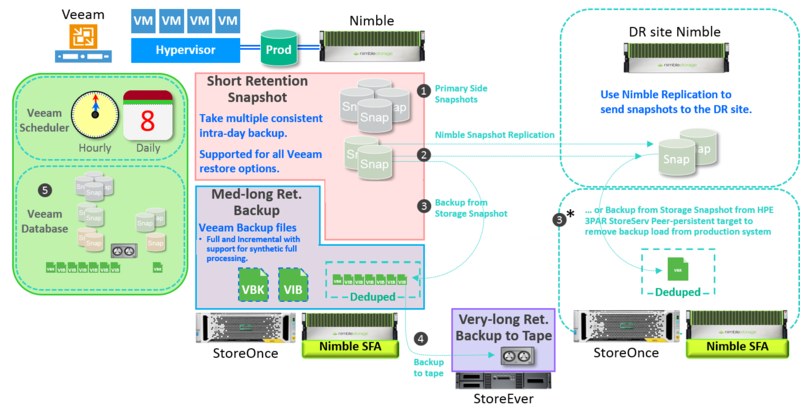 Also, the tight integration with Veeam Backup & Replication has been cited as the #1 reason why customers are buying the new Nimble SFA. But how does all this magic happen? Obviously, the tight integration between HPE storage and Veeam products plays a key role. Today, I’ll be focusing on the updated HPE 3PAR StoreServ integration, which will bring hardware snapshot orchestration to Veeam Availability Suite 9.5 Update 3 (available soon). 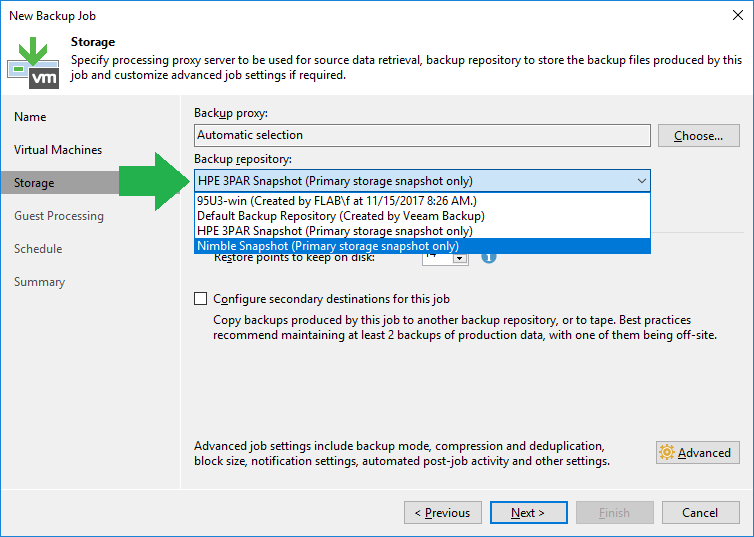 Let’s not forget: Snapshot Orchestration, while a standalone feature, seamlessly compliments all other joint Veeam and HPE features, such as Backup from Storage Snapshot, Veeam Explorer for Storage Snapshots, inline deduplication, Synthetic-Full-Backups, bandwidth efficient Backup Copy Jobs, backup-file protection from malware, Instant VM Recovery from deduped data, and so on. Why should I care about Hardware Snapshot Orchestration? You may already know the answer, but let me elaborate on the benefits just in case you’re doubtful. Snapshot Orchestration is the game-changer here: Now you can make frequent, consistent or crash-consistent Veeam snapshots based restore points with a very limited overhead for your production. When you need to restore your data, you will use a restore point that is less than 1 hour old, rather than reverting to the previous day. The first time I explained this to a co-worker, he argued, "But a snapshot is not a backup!" This is undoubtedly true. If your primary array catches fire or if there is a human/firmware error, then your snapshots are wiped out along with the production data. A good data protection strategy is based on frequent snapshots as well as traditional nightly backup to a secondary storage, and that traditional backup protects you from the rare catastrophic loss of your primary array. For most of the other restore cases, you can restore from a fresh snapshot. But let’s face it. Recovering quickly from backups after a failure while keeping costs down is the top goal in any organization! If you have ever made an Instant VM Recovery, a pre-production test, or a granular restore from a snapshot, you know how fast it is: Snapshot restore is literally as fast as using your primary storage. When it comes to costs, snapshots are cheap. On state-of-the-art storage arrays such as Nimble and 3PAR, it’s not a matter of how many snapshots we keep, but rather how old those snapshots are. Usually 36 hours of snapshots can cost as much as 2-5% of extra capacity, which is not a huge cost relative to the benefits you gain. This was the highlight of Hardware Snapshot Orchestration, but there are many more features to consider. Take a look at the graphic below to see the power and simplicity of this integrated solution. Veeam Backup & Replication tracks all the independent restore points for easy-to-start restores out of the different storages and snapshots. Are you looking for even more insights from HPE and Veeam? Check out our recording of the online conference VeeamON Tour Virtual 2017 where guests asked questions on HPE and Veeam integration to my peer Allan Hammond, EMEA Solution Architect, Data Protection and Retention at HPE.